mugam kAtti –, will show my favorite aspects that include HIS kasthUri thilakam, smiling face etc. ErAr garudan mEl – on top of HIS beautiful garudan. ippollA udambuthanai pOkkuvadhu ennALkolo? – When is the day that this despicable body of mine will get destroyed and the soul will be deemed for you? sUzhndhu – and elucidate me on that so that I will be happy about the concreteness of it. Please think about it. mAmunigaL asks for the exact day when SrI rAmAnuja will take his body and liberate his soul, to be dedicated exclusively to him. He asks when has he decided for that to happen. He also describes what will happen during his final moments. He says that periya perumAL, who is at SrIrangam, will come on top of HIS beautiful garudan and usher him to HIS paramapadham via “archirAdhi mArgam”. mAmunigaL asks, “hey! SrI rAmAnuja! When is the day that you are going to destroy this body of mine that is the sole determinant to be liberated? During the time the soul leaves the body, I will see my mother and father periya perumAL whose sheer existence is revealed by his dwelling in “kOyil” or “SrIrangam”. HE will come on top of HIS extremely beautiful garudan that is described as “am chirai puL pAgan (thirunedunthANdagam 6)”. HE will show me my favorite aspects that include the likes of HIS kasthUri thilakam, HIS beautiful smile that is described as “nal kadhir muththa veNNagaich cheyavAy (periya thirumozhi 4.4.5) and HIS moon like face. HE, who is described as “the lovable companion at SrIrangam” or “arangathuRaiyum inthuNaivanAna thAm (periya thirumozhi 3.7.6)”, will usher me to paramapadham as in “nayAmi paramAm gatham (varAha charama SlOlam) via the path known as “archirAdhi mArgam”. As nammAzhvAr said “un charaNam thandhu en sanmam kaLaiyAyE (thiruvAimozhi 5.8.7)”, emperumAnArE!!! When are you going to offer your lotus feet to me and put a full stop to my cycle of birth and deaths forever? When are you going to take my body and make this soul exclusively for you? 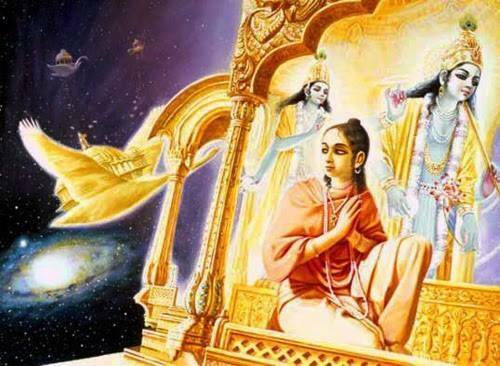 In SrI rAmAyaNam, SrI rAma was given a clear cut time of 14 years to come back to HIS kingdom of ayOdhya in the phrase “pUrNE chathurdhasE varshE”. bharatha was consoled by this as he had a definitive time frame as to when SrI rAma would be back. As per the phrase “ArurOharatham hrushta:” he was able to get some happiness because of the light at the end of a tunnel. However, I am not able to bear any more of these consolatory times. So, please tell an answer that will make me happy. The word “sUzhndhu” here has the same connotation when it was used in the phrase “avAvarach chUzh” (thiruvAimozhi 10.10.11) and “sollu nIyAm aRiyach chUzndhu (periya thiruvandhAdhi 16)”. This entry was posted in Arththi prabandham, Other and tagged arththi prabandham, mamunigal, ramanuja on March 30, 2017 by santhanam rajagopalan.